The Palmer Partnership is the name we have given to the 5-parish partnership, comprising the parishes of Ss Peter & Paul and St John the Baptist, Ilford, St Cedd, Goodmayes, St Teresa, Newbury Park and St Bede, Chadwell Heath; and is the fruit of the diocesan vision and planning process, documented in the recent publication, “Shaping our Future”: https://www.dioceseofbrentwood.net/wp-content/uploads/2017/04/ Diocese-of-Brentwood-_Vision-Document-1.pdf . The vision document speaks of “Renewal and Restructuring”. In regard to renewal, the clergy and Stewards of the Gospel from the parishes in the partnership are already meeting to explore ways in which we can better evangelise, provide the sacraments, collaborate and share resources, and serve our schools and hospitals. Concerning restructuring, this is partly forced on us by the prospect of having fewer priests: our Partnership is being asked to plan for a future with 4 priests as opposed to the current 6. Fewer priests necessitates a reduction in the number of Saturday evening/Sunday Masses in the area from 16 to 12. There are, for example, currently 5 Saturday evening Masses and 2 Sunday evening Masses. An initial proposal, therefore, is to immediately reduce these by 2. As from 27th/28th July, there will be no Saturday evening Mass at St Cedd’s and no Sunday evening Mass at Ss Peter & Paul’s. If you would like to contribute to the discussion on shaping the future of The Palmer Partnership, please speak to your priest or Steward of the Gospel. A common, monthly insert in everyone’s newsletter, entitled “Palmer Partnership News”, will inform of joint initiatives as well as, for example, advertise Mass and Confession times across the Partnership. Please keep the work of the Partnership in your prayers. 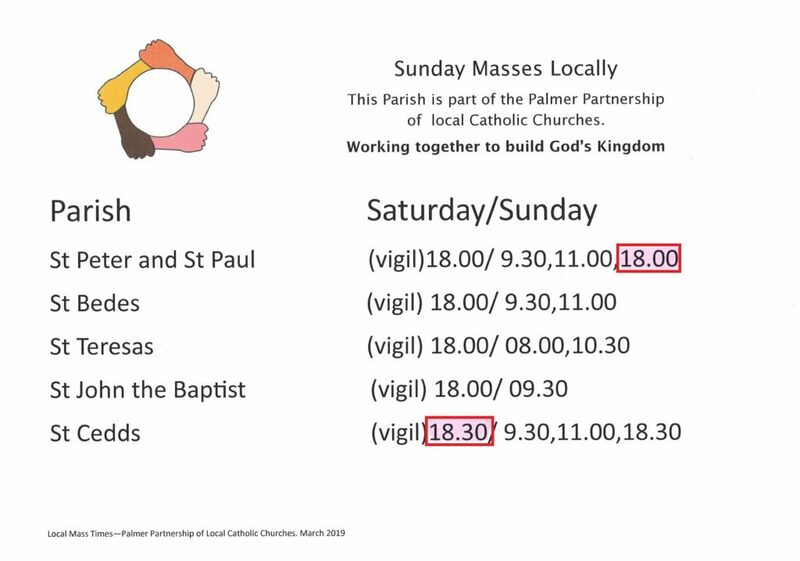 In the image below, the two Masses outlined in red will be the ones cancelled as from 27th/28th of July 2019.